Money! isn't that word which make our dream happen in reality. Everyone wants to earn money in a very short period of time. Either you are into tech niche site, health niche site, blogging or any awkward niche, we all are here, comes for money. Making and earning money is not a easy task. Every blogger wants success and money. Well if we are looking for this article, this is a honest review of Infolinks. It is a name which you are likely to see mentioned when you are reading about monetizing your website or blog. In this article you will check some latest information regarding infolinks like its features, signing process, approval tips, advantages, ads criteria etc. Personally I have tried so many ads networks, but no one beat Infolinks. Infolinks provide number of ads which are displayed on your website or blog and after click on these ads you get paid some amount. In today's post i would like to share a review which is fully based on Infolinks. Have a look! As we all know that Infolinks is one of the great ad network site which provide ads on your website or blog. Infolinks is a CPC (cost per click) and CPM (cost per thousand) based advertising network. Its headquartered is in Palo Alto, CA with an R&D center in Tel Aviv, Israel. You have to just complete the process of signing up. After that company will review your site and asap your site will be approved by Infolinks. It also provide huge traffic to your site. More than 100,000 websites worldwide, infolinks build the standard of these sites. In short, it provide the relevant ads on your blog or site related to your articles, also it does not require any advertising space. And it provide a platform where bloggers generate income. Infolinks provide a great support of online facility. It has also a amazing styling options. It having an power of engaging the readers with the page content. It offers and serve various ad formats to the readers and customers. It boost the traffic of your blog and site. It takes the advantage of search and display, delivering ads just for sake of traffic. It appears in a unique place right above the fold. An ad which act as a functions that is an intermediate of “ad intermission” and "page views". As a result the ads were display timely and encapsulate the website content. It works by scanning of a page’s content/articles in real-time to deliver relevant ads. It display ads related to your articles. The ads are creatively present within a page text. It display the text image ads to attract wide readers and customers. Creative plus innovative display banners will attract huge readers and users on your blog and site. It always present the valuable keywords which is related to the content of a page. It is really an amazing feature. If we talking about the infolinks supportive team, then I must tell you that it is one of the leading ad network site, personally i recommend you to choose its policy and features once. If you find any doubt then you can contact directly to its team. There are professional members who are handling the company and provide the best answers to their customers and users. It is available 24*7 and help you in any way. - Great benefits to your site and blog. - Professional Growth day by day. - Best user interface and relevant. - Full control over Dashboard. - Motivate bloggers and webmasters. - Having good eCPM rates. - Advertisements on multiple platforms. I am sure you will find it amazing. It is an trustworthy site and provide the best results in front of you. It works as intermediate and act functions as an “ad intermission” between page views. It present the ads in a timely duration. The ad will display timely and it is driven by reader and site articles. According to these ads, it is displayed in your article or post body with contextual keywords. Also an blogger will decide the color of text ads links. Iam sure everyone love the images ads because it has a power to attract customers. So the next one is InFrame ads, these are the ads which are display text/image ads which attract number of readers on your blog. Even this is my favoriate one. This one is also amazing. It will appear anywhere in the content and body of the article. Just like as stripe ads. How to Setup an Account? - It offers 2 main option- Publisher and Advertiser. You have to click an option according to your need. - You can also join it with your Facebook account. - Fill all the necessary details carefully. You can become the member via filling the sign-up form. - Registration with Infolinks is a free of cost service. Signing up to Infolinks is absolutely free of cost. Setting Infolinks account is much simpler than other ones. - You have to just fill the registration form by putting required details & information and your website URL. How to Apply for Infolinks- STEPS! - Firstly you have to visit the Infolinks site and click on join button. - Fill out your necessary information and click on sign up button. - After that they will send you a mail and you have to just wait for 2-3 days minimum. - In the end you will get a new mail saying that you are accepted as a publisher. And you can make - money via Infolinks. As we already know that Infolinks consider one of the best ad network site. There is not required any hard efforts to get approval. You can easily get approval for your site or blog. Remember, Infolinks minimum payout is $50. It offers so many convenient methods through which an publisher receive payments i.e: PayPal, Bank Wire, eCheck, Western Union, ACH (only for U.S. bank accounts) or Payoneer. As we all know very well that making money is not a easy task. It is bit difficult. There are so many ad networks are available through which bloggers make money. Lets talk about Publisher Referral Program. 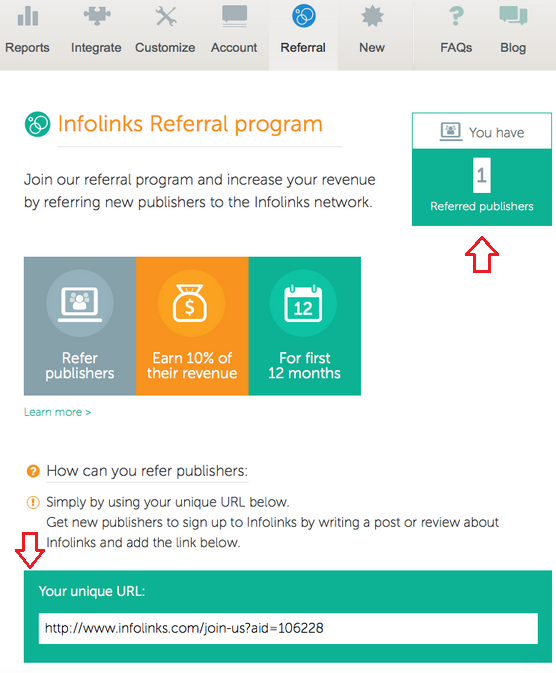 The new publisher referral program is quite simple- It refer new publishers to Infolinks and you can earn 10% of their revenue for just 12 months. Become an Infolinks Referral Partner- Why? Signing is not required, just copy your URL. Select the banners and videos to help you refer publishers. Earn 10% of the revenue from various site. Refer Publishers to Infolinks- How? Visit our referral code and proceed. Write the review of Infolinks and share it on your social networking pages like Facebook page and Twitter Page. In case if you are already an existing partner of infolinks, then there is no need to replace any links, infolinks will automatically shift all your referred websites to the new program. What is AdShop? How to Sign Up? The AdShop is a program which allows the users to create a business of any size to purchase local, inexpensive and affordable advertising on Pattison Onestop's network of digital screens. Now people think what is Pattison Onestop's, so let me clear you about that, it provide a platform for small business which are intimidated by the barriers to entry associated with these kind of huge networks. How to Sign up in AdShop? - Click on this link for joining AdShop. - Fill the details like name, email and password. - After that click on JOIN button. Well, in the end I would like to say that Infolinks is consider one of the best and popular adsense alternative. Bloggers trust on Infolinks site and in return they will earn huge income, plus it will increase your blog traffic. When it comes to ads, then let me tell you that it present number of ads on your blog or site. Different types of ads are InText Ads, InTag Ads, InFrame Ads etc. It provide amazing offers on our blog. At this point, I must say that you have to give it a try, I am sure you will earn some great amount and obvious learn something new and innovative. Infolinks is one of the leading ad network among all over the world. It gives best ads display features and it supports PPC, CPC, CPM advertising model. Basically the main aims to provide a global advertising solution to all bloggers worldwide. This is a honest review of Infolinks. If you having any doubt or query, then you are free to ask. You can also discuss the material related to infolinks in the commenting section, plus you can share this article on social networking sites.